Huge success is the game. What rules of the game are you following? And what resources are you playing with? The perennial questions. I observe four very different approaches to these questions, and few people realize that they are playing under one of these four very different scenarios. The four scenarios vary by whether you are using the same or different resources and processes as the bulk of humanity and by whether you assume the same or different realities as the bulk of humanity, as shown in the figure below. “Best practice” followers (Q1). Is this you? You might be a “best practice” follower if you use the same resources and the same processes that most everyone else does. You look to see what others in your industry and in your local area are doing, and you take on their best practices. You are always doing the best you can to keep up with the pack. You probably provide good services and have good relationships with your suppliers and customers. And, you are often worn out; fatigued from the constant demands on your time. The common story describes the groups in this scenario as market followers, the somewhat-risk-averse majority of folks who take up new resources and processes once they have been proven by the innovators and early adopters. The common recommendation is that these groups regularly benchmark themselves against best practices in the industry. The Ecosynomic story describes groups in this scenario as living predominantly in the reality of outcomes, focused on improving the performance of the proven capacities they already have. This is the things or noun level of reality. Some groups in this scenario are also dipping their toes into the strange waters of the reality of development, learning, and capacity building. Our research at the Institute for Strategic Clarity finds that this scenario describes the experience most people have in most organizations and communities. What can you do if you are living the scenario of the “best practice” followers? Ask yourself, “Is this the best experience and are these the best outcomes that I know are available to our group? Are we capable of better?” If you know, somehow, that your group is capable of more, you might explore the Harmonic Vibrancy Move process, which guides you to finding the processes and agreements that you prefer. “Great” performers (Q2). You might be a “great” performer if you tend to be on the leading edge of innovating and adopting new resources and processes. You are often described by others as being among the best at what you do, keeping ahead of the pack. You are proud that you provide great services to your customers and have great relationships with your suppliers. You often experience exhilaration at your many successes, while combating continuous burn out from always running on all cylinders. The common story describes groups in this scenario as innovators and early adopters, pushing the edge and redefining how they play within the current game. Many of these groups are described in the “great companies” categories of business journals and books. They are finding much more effective and efficient ways to do their work. What can you do if this scenario describes your reality? Would you like to push much further, achieving much better outcomes (the destination) and much better experiences along the way (the journey)? You might explore the results and experiences people are having when they change the foundational rules of the game, playing with different realities than everyone else. The “amazing” needy (Q3). You might be one of the “amazing” needy if you are a magnet for amazing people. Everyone marvels about what you are able to do, who you are, and the principles that guide your life and work. You have great relationships with almost everyone, from your customers and your fellow employees to your suppliers and others working in the same industry and region. And, you always struggle to stay afloat. You never have enough money. Many people try to help you stay afloat by recommending processes or resources (“I know a great fundraiser.”) that you don’t feel are quite right for your culture, but you are not sure why. The common story describes the groups in this scenario as inefficient at best, and just plain odd. While these groups work hard to do some great work, they just don’t follow good practices, as evidenced by their consistent struggle to stay afloat. The Ecosynomic story of this scenario suggests that groups in this scenario are operating, often unconsciously, from a completely different reality than the bulk of people. They have embraced, for some reason, the realities of potential, development, and outcomes, all at the same time, giving great importance to healthy relationships in all five primary relationships (self, other, group, nature, spirit). They have also accepted “common” practices for how people decide what resources they have, who decides how to allocate those resources and how to enforce that decision, the criteria used to allocate the resources, and how people interact. These common practices usually limit the abundance-based culture you want to live into, capturing you in a scarcity-based process and experience. In this scenario, we find many frustrated social entrepreneurs who don’t know there are others who have figured some of this out — how to live this culture from abundance-based practices. What can you do if you are living this scenario? By making explicit the deeper assumptions about reality embedded in your processes, you can see if they are aligned with the deeper assumptions in your culture. If they are not, then you can use the Harmonic Vibrancy Move process to identify agreements, processes, and structures that others have discovered that do align with your abundance-based culture. The “weird” mavericks (Q4). You might be one of the “weird” mavericks if you are extremely clear and persistently dogmatic about your vision for a better way of engaging in the world, with a heavy focus on developing and sustaining very strong relationships and outcomes. You are often described, equally by those who know you and those who don’t, as a maverick, who won’t play by the rules of the game; a weird ruler breaker, who when successful has changed the entire game everyone else plays. While you have great relationships, within your culture, you feel all alone in the world, without peers that recognize the seeming obviousness of what you are doing. The common story is that people in this scenario are outliers, thus they don’t fit in the norm, and are discarded from normal analysis. They are far from accepted practice. Their practices look weird, and while they have proven to be lucky over and over again, they are not to be imitated. The Ecosynomic story suggests that this scenario is not odd, weird, or lucky, rather that these people are discovering the new normal, the reality we all want to live and don’t see how. Our research now shows that the reason these groups are hard to understand is because they are playing a different game, a game where you can sustain high levels of success in your outcomes and experiences. We have documented over 20,000 groups living this way, right out in the open, and we have met 77 of them in the past five years. It is not weird, it is different. Different realities driving different resources and processes that lead to different outcomes and experiences, the outcomes and experiences we all want. What can you do if this scenario is your reality? In the 77 groups like this that we have met, most are quite unconscious of what it is that makes them so successful. By looking at their own agreements through the four lenses of the Agreements Evidence Map, they have been able to consciously choose their agreements, and how they want to improve on them. Thank you for this post. The 4Qs make it very easy to understand the kind of success we are talking about. In my understanding the current definition of the term success is quite misleading, since it points to a kind of success using agreements rooted in scarcity-driven competition. Those underlying agreements have proven to be incapable of being “successful” in addressing human “success” over the last centuries. 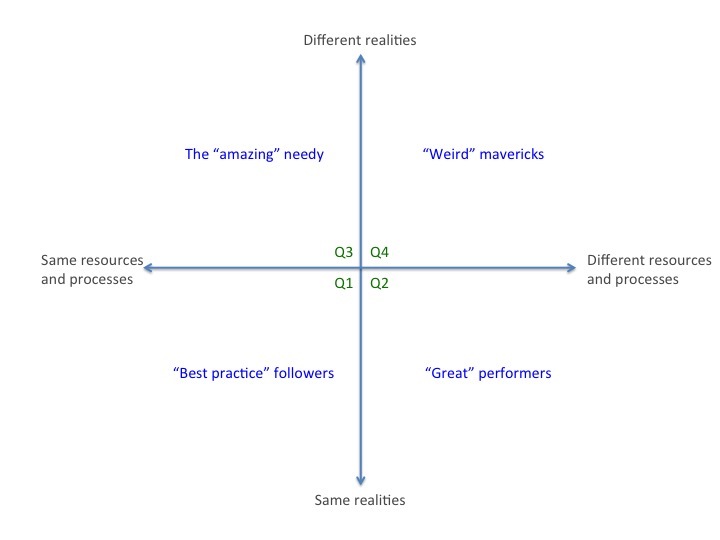 The 4Q Matrix helps to understand that “real success” cannot be achieved by starting from scarcity – aiming at optimising individual achievement at the expense of the (social) system – but instead by supporting agreements that allow for social collaboration within a given system. Thus, maximising individual and systemic achievement and moving the dynamics of the system into a “regenerative” rather then “extractive” mode. Merriam-Webster defines success as the fact of getting or achieving wealth, respect, or fame // the correct or desired result of an attempt // someone or something that is successful // a person or thing that succeeds. http://www.merriam-webster.com/dictionary/success the Oxford Dictionaries define it in a similar way.